Feng Shui bamboo fountain and the full dept of its relationship with ancient Chinese philosophy is something I could not hope to cover everything about on this site. However, I can provide guides to some of the benefits it can bring to your home and life. The following article was written by Amy who is a fountain artist and designer. A water fountain is one of the most popular applications in home decor and combines two auspicious elements: bamboo and water. Bamboo is considered to be one of the most auspicious elements in traditional Asian cultures. Symbolically, it stands for longevity, friendship, diligence, and adaptableness. In Japanese culture, surrounding many shrines, mainly because it is believed that the plants sacredness keeps the evil spirits away. Water represents creativity and passion. It is associated with three astrological signs: Pisces, Cancer, and Scorpio. Feng Shui, an ancient Chinese art of creating spaces that are filled with harmony and peace, literally means “wind-water”. In western culture, moving water is associated with money (e.g. cash flow, slush fund, liquid assets, bank (i.e. river). In a classic feng shui sense, moving water represents “chi” – the life force energy. 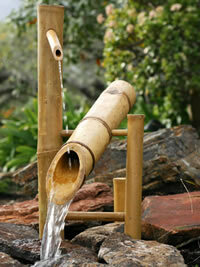 When bamboo is synergized with water, an abundance of chi is created. Such a water fountain unleashes your creativity and passion by unblocking the chi cent ers of your indoor spaces. Trickling sounds of water creates a relaxing sensory experience, thereby soothing your auditory senses. Spouts create natural visual appeal with warmth. Its combination that includes flowing water creates a miniature natural steam, enhancing your sense of serenity. Adding a plant to your water fountain represents life and growth. A green plant by your desk adds a personal touch to your desk along with a green soothing sight. When choosing a location for your water fountain, following the principles of “bagua” (8 areas) helps you drastically improve your life situation. Bagua is an ancient art that connects the areas of your indoor space with the areas of your life. An indoor fountain makes an excellent indoor home decor element as well as powerful feng shui focal point. Amy invites you to browse unique and handmade collection of water fountains at the Tabletop Fountain Store where you would find vibrant collection of indoor fountains as well as a collection for your gardens.